Some people have said that Americans go to hockey games to see fistfights and go to NASCAR races to see car crashes. This thought occurred to me over the past few days while reading The New York Times online. If there were a New York Times index, it would indicate that the financial crisis is over. I can’t recall the last time a financial crisis-related story was at the top of the home page. (Today’s Fed intervention into money markets may have been on top, but by the time I got there the lead story was Kirk Kerkorian selling stock in Ford.) Instead, we’re back to the presidential election and Iraq. For a while there, it seemed like we might have the car crash to end all car crashes in the financial system, with banks failing left and right. Now, it looks like we’ve just got a boring old recession, where millions of people will lose their jobs. Move along. But even if the multi-car pileup has been averted, the cars are still just barely limping around the track. The problem seems to be a lack of fuel – credit, in this case. Andrew Ross Sorkin in that same New York Times points out that banks are taking their money and stuffing it into a mattress instead of lending it to companies. (Yves Smith at naked capitalism says that consumers are doing the same thing, which, while personally wise, is not the best thing for the economy.) Now, banks only make money by lending money. So why aren’t they lending? My homespun theory: Banks are run by people, notably CEOs. CEOs are people like the rest of us (just richer and, often but not always, fatter). They are motivated by two main things: (1) making a lot of money and (2) not looking like an idiot. Maximizing profits for their shareholders is far down the list. Boards of directors are primarily motivated by (2), not looking like an idiot (and getting sued). In good times, when people underestimate risk, this leads to lots of leverage and juiced-up profits. In bad times, both motivations produce behavior that may be irrationally conservative from the standpoint of the shareholders. A CEO with a $5 million base salary who knows this year is going to be terrible and that he won’t get much of a bonus has no incentive to increase profits. He does have an incentive to make sure his bank stays in business – so he keeps getting that base salary – which means being as conservative as possible with cash. He also has no desire to go bankrupt and get hauled in front of a Congressional hearing (motivation #2), which again means being as conservative as possible. Note that this is irrational behavior for the company as a whole. As a shareholder, I want the bank to take some risk, and I am willing to accept some risk that it will go bankrupt; otherwise I would just invest in Treasury bonds. I can diversify away most of that risk by buying stocks in other companies. The problem is that the people running banks have very concentrated incentives that lead them to behave in ways that are not good for shareholders. Is there a solution? I don’t know. 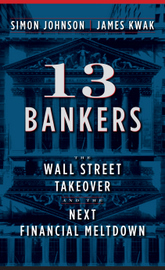 In some countries, the government would take control of banks (at least by choosing the executives, like at AIG), but Paulson explicitly chose not to buy voting shares, and that was probably necessary to (a) get the banks to agree to the recapitalization and (b) maintain support in Washington and among the public at large, which is still deeply distrustful of direct government intervention. Basic microeconomics says that competition will lead some banks to start lending and take market share from others, but in an oligopolistic situation (I believe the nine banks that were bailed out first have about 60% of all banking assets in the country), that may not happen. Some form of government guarantees for loans may work, although I’m not sure what the details would be. We may have to wait for greed to once again take over from fear in the heads of those CEOs. Luckily, it always happens. The crisis raises some tough problems. Should we, as a society put caps on what CEO’s (heck, how about everyone) can make? There are responsibilities that a CEO has to be asked to shoulder that are big, but as we all know, many CEO’s seem to form a strange “Country Club” where they make 100x what a normal worker makes. They become so out of touch with reality of having to deal with money on a personal level, that I’d argue they become less effective at making rational decisions. Would it make sense to put some 20x cap in place? Gosh, that sounds rather socialist, but if the market isn’t going to enforce some kind of rational cap, we may need to consider it. One of the big societal problems that I think we have seen in the last 8 years is that the divide between rich and middle has grown. How do we address that problem? Certainly tax law change could help, as could removing some of the loopholes and subsidies for the rich. I see those loopholes as corruption brought about by lobbies funded by rich people. But you are quite right. There is not a simple solution. Asking a CEO to only be paid a modest salary compared to his peers would be recruiting suicide for many companies. How do we balance the equation? Is there some other reward besides money? Prestige? Respectability? Seems like a long time since those mattered to leaders. It is becoming abundantly clear that the importance of raising consumer confidence is now egregiously outweighed by our need to raise creditor confidence. Contrary to the doom and gloom that is served via the media onto our dinner tables, there are scores of solvent, cash generating businesses and individuals out there that would ultimately prove profitable for these “born again” banks. However, as you stated, these lending institutions are laying their fatter asses on their gilded gold toilets, waiting for something to drop. So while we should be concerned that I, the most fervent and confident of consumers, decide to walk out empty-handed at a Barney’s half-off sale, it is more troublesome that solid investments are being passed up by trembling creditors. I personally think that the tighter credit market is necessary to trim the fat off of our overweight country that has enjoyed 10+ years of excessive consumption and living off of borrowed money. It is extremely sad to see personal savings rate decrease from 9 percent in the 90s to negative percentage currently (and personal debt rate increasing concurrently). How is capital formation suppose to take place like this? Banks have learned a lesson from their lax lending practices and the Administration’s encouragement to banks to continue along this path (so that GDP can continue to grow) is not very prudent, economically speaking. This idea that American consumers can or should spend their way out a recession is idiotic. American consumerism has fueled global growth for what can only be described as “too long” in objective terms. We need to look for a new engine of growth besides vapid self-agrandizement and extra-huge flat-screens. Yeesh! It’s not like there aren’t problems worth solving in this world; it’s that the problems cannot and should not be solved by an increase in consumer debt. “banks ONLY make money by lending money” ? You must be kidding! Isn’t this crisis about the way banks invested thier customers’ money in order to obtain higher returns? And what of the fees banks are charging their own customers for transaction costs? Say an average customer performs between 50-100 transactions per year, and suppose a bank has a customer base of 10,000,000 customers: wouldn’t you like to make a transaction commission too? That is not counting other relatively banal things like sending a wire – which can cost up to $50 dollars and take up to TWO WEEKS. In mainland Europe or Asia this is an overnight transaction. The future will be exciting if we are able to build a world of “scale-free, distributed power” instead of Persian, Greek, Roman, Spanish, British, American or (Chinese?) Empires. The former will prove to be far more resilient to change and will evolve better. Most of those bank “investments” are really loans. First of all, if you look at the balance sheet of a bank like Washington Mutual just before it failed, a large portion of it is good old-fashioned whole, unsecuritized mortgages. Second, if you buy a CDO, you are loaning money: you are loaning it to the people who issued the CDO, who are loaning it to the people who sold them the underlying assets, who are loaning it to people to buy houses. Put another way, you are laying out a chunk of cash and getting a fixed (but risky) stream of payments in return. If no one makes those “investments,” then there will be no money available at the end of the chain for loans. It is true that in certain banking businesses, fee-based income is increasing relative to traditional interest-spread income. Credit cards are one example. Again, however, in order to get those fees, you have to lend money. You can’t charge fees to your credit card customers if you aren’t willing to lend them money in the first place. If you want to start a bank that just takes deposits, charges your depositors lots of fees, and invests the money in Treasury bills, I don’t think you’ll stay in business for very long. Fire them all and let the second rank take over. The solution is obvious: Negative bonuses. Banks only make money from lending if the borrowers also make money (allowing them to repay the loan and interest). Apparently banks don’t think there is anyone in the US economy who can make money over the next couple of years. Is this a rational belief? Mmmm…. could be. The US has very large and rapidly increasing debts of all kinds. Let’s simplify and assume the Federal government takes over all failed debt in the US. To maintain this debt the US can do one of three things: it can print money to pay the debt; it can default; or it can raise taxes by a very large amount. Printing money is the most likely scenario. But this would result in extremely unpredictable economic effects. Some people are going to be able to change these vast sums of green paper into vast sums of some other color paper. Others are just going to end up with lots of paper and little profit. But why lend to people who might (or might not) be able to change future dollars into future gold when you (a large bank) can just take the dollars you have now and change them into gold…. now? Defaulting on the debt would also have unpredictable effects. How would it even work? Private pensions and health care will fail if their bonds become worthless. And the government then has to take over those pensions. Since we are running a large deficit now, the only way to fulfill our obligations would be…..
Raising taxes. The government’s obligations are large and growing rapidly. Closing out rapidly increasing deficit would require draconian tax increases. Who would end up paying these tax increases? Well, basically the only businesses who can pay increased taxes are those who are making a profit. And draconian tax increases will obviously mean that they are making a lot less profit. A LOT less. So, very likely, no one is going to be making good profits in the United States in the next few years. If they do, the government will take their profits to…. give to banks now. What the government is doing is taking out a loan from Main Street to give to Wall Street. Why would you expect Wall Street to turn around and lend it back to Main Street? How can Main Street possibly make a profit lending themselves money? One way to fix the problem would be to take away short term options that are so often used for compensation. (Because they are seperate from the companies cash flow and usually just dilute the share price). Instead of short term American options CEOs should be compensated with European options where the volume of those options increases over the next 20 years so that the CEOs fortune is not made on pumping up the stock price in the short term(quarterly) earnings but by building the company for the long term. Thanks for all the comments. I wanted to address the topic of compensation first. I agree with Peter that there is no good reason for CEOs to be paid as much as they are. Unfortunately, there is a market for CEOs, and the salaries they get are the market price. I believe it is a very poorly functioning market. See Rakesh Khurana’s book on the topic (http://www.amazon.com/Searching-Corporate-Savior-Irrational-Charismatic/dp/0691120390/). I also have a little experience in the subject, having been through a CEO search for the company I co-founded. I think it would be great if boards of directors would read Khurana’s book and take it to heart, because if the buyers were smarter, they wouldn’t be overpaying so much to the sellers. So now that you know where my sentiments lie … my concern with regulatory schemes to limit executive compensation is that I don’t think they will work, as long as the buyers (the people hiring the executives) have misplaced ideas about what individual executives are worth. Two things will happen. First, talented people will leave the industry. (Now, in the unique case of financial services, this might actually be a good thing, because you can make a strong case that too large a proportion of our smartest, best-educated people are going to Wall Street.) Or, more likely, they will go to the less-regulated parts of that industry – is anyone suggesting regulating hedge fund compensation? is it even possible, given that these are private companies? For example, I don’t see any CEO signing up for possibly negative bonuses – unless you give him a much higher base salary, which just amounts to the current situation. More broadly, though, my point is less about CEOs themselves than about the broader problem of misalignment between the incentives of shareholders and management. Broadly speaking, I think reforms that give activist shareholders more input into their companies could help. Banks aren’t lending money because the consumers and small corporations with the ability to re-pay are loathe to take on debt given perceived job insecurity. The slow down in consumer spending is evident, it’s just delayed in some sectors, specifically education and health care. I work for a residential lender. The only deals coming in the door are crap deals, deals the originating lender would never contemplate holding in portfolio. Part of the reason that banks aren’t lending is that the secondary market for loans has shut down. Banks are now part of the originate and distribute model of banking. The days of originate and hold are long gone. Bank profits largely come from fees, not from warehousing loans. Banks do warehouse loans, but the loans held in their portfolio are cherry picked and the portfolio is carefully managed. Without a secondary market for loans, a banks’ ability to manage its portfolio of held loans is impaired and their portfolio is quickly filled. In addition, as others have noted, in a downturn banks seek to hold fewer loans. 1) FED is paying 1% interest on reserves. Banks are making more money with less risk sitting on reserves rather than lending them. 2) Fed Funds rate too low. The FED created too much money and surpassed its 1% target. Inter-bank loans are now being made at .13%. I would assume their volume has gone down, as banks are more likely sitting on reserves than loaning to each other. 3) Risky Market. Increasing unemployment, still-falling home prices, rising consumer credit delinquencies, etc. all point to higher lending risks. 4) Unprofitable Market. What’s making money right now? Where would you loan money? Exactly. Just as people are sitting on money or seeking safe assets, banks are doing the same. 5) Unknown future losses. Banks know losses are coming (although not the quantity and precise dates), and they’ll need cash to cover. Why loan out this cash now, if you risk having to pay more borrowing it back when necessary? The banks are doing the only logical thing they should right now. They are avoiding risk, shoring up cash to cover losses, and making money at the same time.